Each column in your table has a type. It means that it is intended to receive a specific type of information. Column types allow you to store data according to your usage or scenario. What's more, data entry is guided and sometimes restricted by the selected type. For example, you won't be able to enter free text in a Date column. RowShare provides more than 20 different types for your table's columns. Each column has several options depending on its type. For example, the maximum length of a text, the minimum and maximum values or the number of decimal for numbers. Text: Used for simple text. Rich text: Used for multi-line text andenhanced with effects (italic, bold, underlined, justified…). Hyperlink: Insert links to other web sites, optionally with a description different from the actual link. Email: Validates that text entered is an email address. You will only be allowed to enter values matchin the format "username@domain.com". Integer: Exclusively for whole numbers, without any decimal part. Positive or negative, for example 130 or -5. Decimal: Used for decimals numbers. Positive or negative, for example: 248.1 or -54.25. Money: Used for monetary values. By default, the currency matches the language specified in the table, but you can change it in the column options. For instance, € if your table is in French, or $ if your table is in U.S. English. Percentage: The user must enter a whole number and the result will be displayed followed by the percentage sign (%). In the options, the value 1 here means 100 %, for example: with a minimum value of -1 and maximum value of 1.5, input is allowed between -100% and 150%. Auto number: Number that automatically increases, starting at 1. This number will be unique to each of your table's rows. It’s useful for obtaining a simple unique identifier for each row of your table without having to enter or maintain it manually. It can’t be changed manually. Yes / No: Instead of typing Yes/No or True/False, Editing is done using a checkbox to facilitate data entry. Rating: Used to display stars and rate rows. Vote: Each contributor may vote only once in a vote-type column and per row. Clicking again removes the vote. The column displays the total number of users who voted. Calculated Values columns are covered in their own Help page. List of options: Displays a list of values as a drop-down list. This list can be configured by the table owner in the column’s options. This column type has a specific option: Allow multiple values, to let users select several options at the same time in the drop down list. Linked List: Similar to List of options, but the list of values comes from a column of a RowShare table. 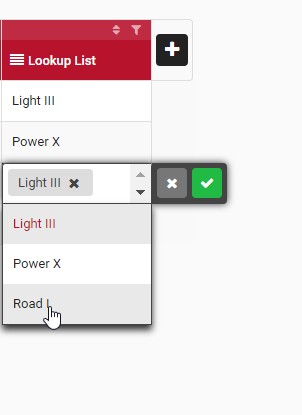 You can choose the source table and the source column in the column’s options. Date: Dates can be edited using a calendar. Time: Provides an optimized editor for selecting a specific time. Date and time: Used to display together a date and time. A special editor allows you to select both. Reminder: Used to manage reminders and deadlines. When a reminder is due, the row owner will receive an email notification letting them know that a reminder is due for that specific row in that table. Reminders are time-zone sensitive, based on RowShare users’ time zone setting. If you set a reminder for less than 10 minutes away, it might not trigger an email. For testing purpose, set your reminders at least 10 minutes ahead of time. Image: A thumbnail is displayed in the cell. Move your mouse over it to see the full picture. Click on it to download or modify it. File: You can store any type of file, one file per cell. Both files and pictures are subject to a size limit, per file/picture and per table, according to your RowShare Plan. Visit our pricing page to learn more about the possibilies of each plan. An "Automatic" column is automatically updated by RowShare and the user cannot change its values. Row owner: Automatically displays the name of the row's owner. Clicking on it lets you reassign the row to another user. Row owner’s Email: Automatically displays the email address of the row's owner. Row owner’s manager: Automatically displays the RowShare name of the row owner’s manager. Setting a user's manager is a feature of RowShare Business ™. Row owner's manager email: Automatically displays the email address of the row owner’s manager. Setting a user's manager is a feature of RowShare Business ™. Creation date: Automatically displays the row's creation date. Last write date: Automatically displays the date the row was last edited. Commenting a row does not change its last write date. Unique identifier: Automatically displays a unique identifier for the row in form of a globally unique identifier, across tables, space and galaxies. For example: 0c11c30765b946f88154a53ac549ced3. If you add one or several Comments columns to your table, any user who can see the row will be able to comment it. Comments display when they were written and by whom. Only its author and table owners can delete a comment. If you make a Comment column read-only in its settings, then only table owners will be able to add comments.